AdNaNoTek is a rising leader in vacuum coating equipment, we design and manufacture full range of coating equipment, such as: Pulsed Laser Deposition (PLD), Molecular Beam Epitaxy (MBE), Atomic Layer Deposition (ALD), Plasma Enhanced Atomic Layer Deposition (PEALD), Magnetron Sputtering System (Sputter), Ion-Beam Sputtering Deposition (IBSD), Dual Electron-Beam Evaporation (Dual E-Beam), Integrated Systems, and Customized Systems. With our technologies and vast experiences, we can provide various types of coating services and technology transfer, such as: Diamond-like Carbon (DLC) coating, Zinc oxide (ZnO) deposition, Tungsten Disulfide (WS2), and the likes. Our coating technology can work for all kinds of substrates, such as Glass substrate, Silicon substrate, Strontium Titatinum Oxide (STO) substrate, Plastic substrate, etc. Moreover, our coating processes can operate at ultrahigh vacuum, high vacuum, high temperature, room temperature, and other conditions. AdNaNoTek provides high quality UHV products and coating services services all-throughout the world, and we are in cooperation with Taiwan's top universities and research institutions. ZnO has a bandgap of 3.37eV and binding energy of 60eV, hence it can be used in applications that uses ultraviolet lasers, semiconductors and optoelectronic applications. In addition, ZnO have high refractive index, high thermal conductivity, antibacterial and UV protective properties hence, it is usually used to coat or added to the several materials and products, including plastics, ceramics, glass, cement, rubber, lubricants, paints, ointments, adhesives, sealants, concrete manufacture, pigments, food, batteries, ferrites, fire-retardant agents, etc. Pulsed-Layer Deposition (PLD), Atomic Layer Deposition (ALD), and Sputtering (Sputter) techniques are the common techniques that are used to coat materials with thin layer of ZnO with high purity and uniformity. Opto-electronics parts, solar cells, semiconductor materials are the usual materials being coated with ZnO. AdNaNoTek UHV Deposition Systems provide ultra-high vacuum environment to reduce contamination; provides good pulse laser to enhance process stability; and simple and reliable user interface to ensure reproducibility and high production rate. 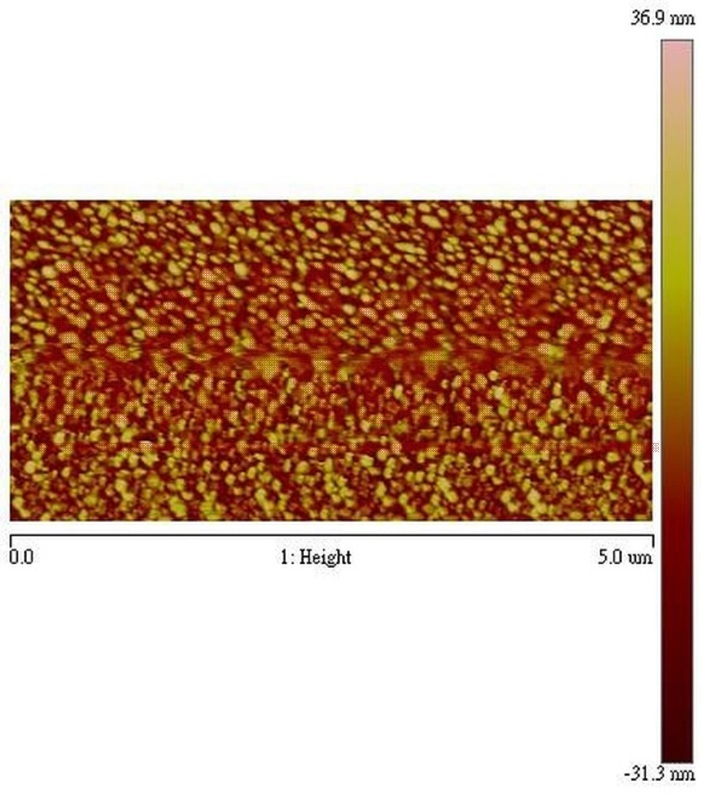 Images shown are thin layer zinc oxide (ZnO) deposited on sapphire substrate using AdNaNoTek's Pulse Laser Deposition (PLD) system. High quality (in terms of purity and uniformity) ZnO thin film was obtained.